Warranty Statement: The minijump starter (battery box) is warranted against defects in electronic malfunction for a period of one (1) year. Accessories such as jumper cable (clamps), USB cable and laptop tips are warranted against defects for a period of 90 days. We will, at our option, repair or replace the jump starter, which proves to be defective in materials or workmanship within the warranty period. The foregoing obligation is Rockford' s sole liability under this or any implied warranty and under no circumstances shall be liable for any incidental or consequential damages. Warranty: We will replace any defective unit that proves to be defective in material or workmanship with in this warrant plan. This warranty does not cover damage to device a rising from alteration, abuse, misuse, and does not cover any repairs or replacement made by anyone. 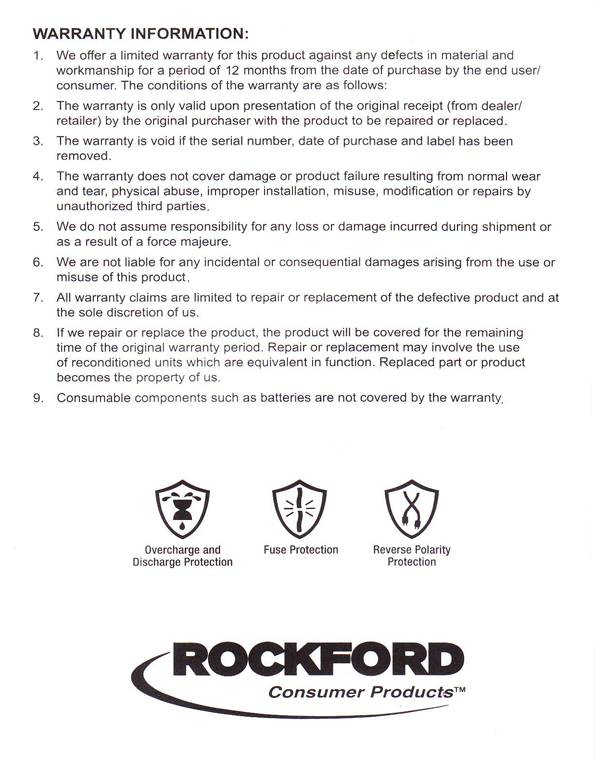 Procedure: If defect is detected within one year of purchase,return to Rockford warehouse with pro'of of purchase for warranty repair or replacement. Original receipt MUST accompany any and all warranty claims.